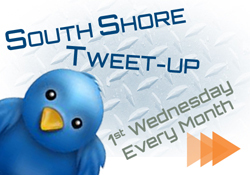 This group is where you get the chance to chat, drink, eat and network… People interested in technology, social media, social networking here on the South Shore.. or people wanting to learning about it are welcome. We usually have a short presentation on some aspect of web related technology like video for the web, facebook marketing, or sometimes just a fun social media quiz. Several great web people around the South Shore are there on a regular basis – come by, have a drink, eat, network, and pick someones brain! We meet the first Wednesday of each month at Summer Shack, Derby St. Shoppes, Hingham, MA. 6p. – put it on your calendar!